Seating in the round—arrive early for a chair! A scene from My Barbarian's PoLAAT Intro: Post-Paradise. BOTTOM LINE: My Barbarian showcases the hits of eight years of international workshops, theater games, and adventures, bringing a troupe of theatre artists together for audience participation with political bite. In 1969, Rainer Werner Fassbender responded to the Living Theater's Paradise Now with a piece titled Pre-Paradise, Sorry Now. In 2016, My Barbarian responds to that response with their production of PoLAAT Intro: Post-Paradise—and if you find that joke hilarious, you’ve come to the right place. Post-Paradise is part of My Barbarian’s larger residency exhibition at the New Museum, The Audience is Always Right. In this performance, My Barbarian brings together a group of artists for a PoLAAT workshop wondering aloud what happens next. PoLAAT stands for “Post-Living Ante-Action Theater,” locating My Barbarian’s project in the continuum of audience participatory social justice theatre movements, which worked to enact radical collective ideas with an understanding of each other through participation-based theater. 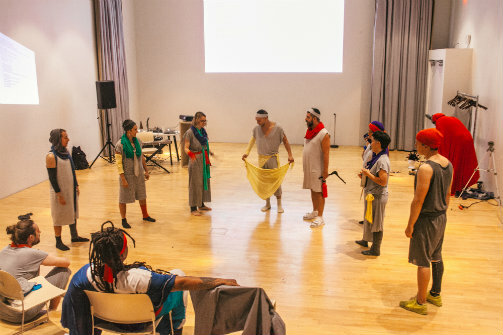 In the two forms PoLAAT especially targets—the Living Theater founded in the 1940s on anarchist principles, and the Action Theater method created by Ruth Zaporah in the 1990s—improvisational theater games and physical action connects actors, audiences, and communities to one another. Over the past eight years, My Barbarian’s PoLAAT project has developed a model of five techniques to describe and motivate collective performance. In Post-Paradise the company moves through each of the five in a series of movements filled with singing, games, and social critique. Most of the movements begin with a “didactic song,” a technique developed by Bertolt Brecht of using music to explain the purpose of the action onstage, one which features prominently in activist theater practices. The performance company is an assemblage in itself. In addition to the three members of My Barbarian—Malik Gaines, Jade Gordon, and Alexander Segade—the company features ten performers from the wide variety of countries where PoLAAT has done workshops since its founding, including artists from Europe, the Middle East, and the Americas. As a result, the multi-national consequences of current political events are a recurring topic of improvs and scenes. As the company begins telling their origin stories, arranging one another and audience members in complex tableaux to illustrate how their nation has changed in eight years, it becomes increasingly obvious that we all face similar crises: climate change, violence, government corruption and apathy, and frustration with the marginalization of those calling for change. As PoLAAT moves through their five tactics, a series of responses to feelings of political impotence begin to emerge, and the games becomes progressively more complex. Featuring some of PoLAAT’s greatest hits, Post-Paradise physicalizes many of the concepts written in My Barbarian’s original manifesto for the project, and brings the videos of the workshops seen in the New Museum’s continuing retrospective to life. The five techniques of PoLAAT are “Estrangement, Indistinction, Suspension of Beliefs, Mandate to Participate, and Inspirational Critique.” In Estrangement, the company instructs the audience (and themselves) to “draw a perforated line around your body,” following the Brecht tradition of alienating oneself from the theatrical action to critically analyze it. Indistinction toys with language, as the company uses translation to make words silly and strange. As the night goes on, Post-Paradise pulls in more audience members to play games and interject into stories, drawing on techniques of living theater, Fassbinder's antiteater, and other participatory models to push the audience to play and think. A highlight is the call for “suspension of beliefs,” where the company performs a real-live levitation flawlessly. Visually, the production has a toybox feel. The audience is seated all around the space and the line between playing space and audience is fuzzy (arrive early to guarantee yourself a seat in a chair), and performers use a series of boxes, a wide variety of musical instruments, and one another to create stage images. The costuming extends the DIY community spirit, with the performers adorned in strips of brightly colored jersey fabric tied in whatever fashion, making each person unique but visually unified. Post-Paradise actualizes the political goals of My Barbarian perfectly, and offers a wonderful opportunity to play and create with this innovative art collective as they separate eight years of fun, powerful, transformative international work. The performance adds a wonderful dimension to the New Museum’s retrospective of the PoLAAT workshop, letting an audience experience a dimension of the work that only exists in time. It’s exactly what improvisational, activist theater should be, and it brings together a community that crosses borders of all kinds in a delightful evening of silly games for real change. You can see the exhibition anytime during museum hours, and there are two more events scheduled during the residency. PoLAAT Intro: Post-Paradise is devised by My Barbarian. My Barbarian is Malik Gaines, Jade Gordon, and Alexander Segade. The cast is Wenzel Bilger, Vicente Colomar, Miguel Gutierrez, Ryan G. Hinds, Matana Roberts, Sahar Sepahdari, Ginger Brooks Takahashi, and Joce and Naty Tremblay.